To say that Red River Harley-Davidson® loves the local community is an understatement. Every employee of RRHD lives in Wichita Falls, Iowa Park, or the surrounding area, so it’s fair to say we all have a special interest in the local events RRHD puts on and we all go the extra mile to make them a success. Everyone knows about our RRHD Saturday cook-outs during the spring, summer, and fall but did you also know that RRHD purchases all of the food and supplies that are donated? That’s right. The local charities simply have to show up. On top of that, 100% of the donations raised from the food served throughout the day goes back to their local charity. RRHD does not take a cut in any way, we truly want our local community to thrive, this is OUR community too, and we think this is a great way to get our fellow members involved. What better way to bring people together than food, drinks, and a love for MOTORCYCLES!? 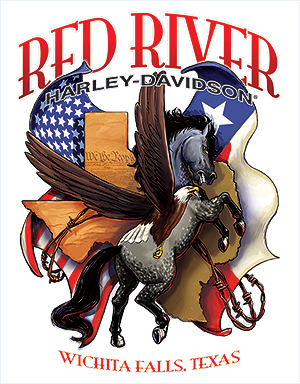 Over $15,000 was raised this year by 27 different charities during Red River Harley-Davidson’s® Saturday events. Although many charities participated, The American Legion Honor Guard raised the most for a single charity. They informed us they will use it to put over 800 wreaths on Veteran’s Graves in December. Thank you for your support to make this such a worth while endeavor. We truly love our local community! We are so proud to be a part of the Wichita Falls community and we encourage you to always keep it local! 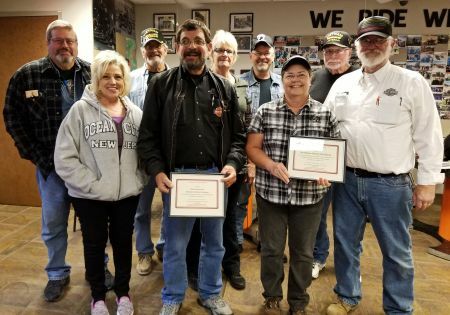 Pictured: Ted "Frosty" Foster & Ray "Tex" Calvert recognized Nick Nesevich on behalf of the American Legion Post 202 & Wreaths for VETS of Wichita Falls for all of the AMAZING WORK that he does for Red River Harley-Davidson® (everyday) but specifically for all of the work he does to keep our weekly spring/summer/fall cook-outs up and running smoothly! Nick makes sure everyone is signed up, informed, and ready to make money for their charity week after week. From set up to clean up, Nick takes care of it all and we cannot thank him enough! Great job Nick! And a big thanks is in order for Jim & Vickie Gilmore (RRHD) for caring so deeply for our local community and creating such an amazing opportunity for our local charities to prosper. RRHD loves our local community!! Let's see if we can beat our donation record next season! !